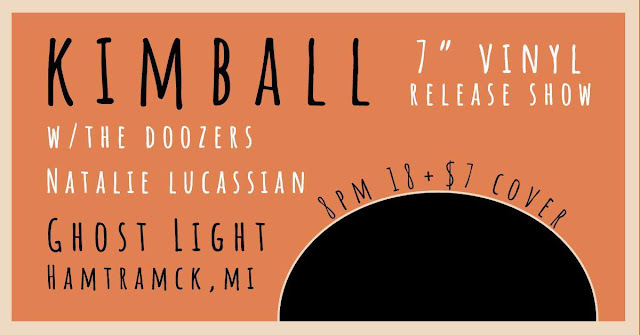 This Saturday night, Kimball will be taking over the Ghost Light in Hamtramck for their 7" release show! The new EP is being released by Jett Plastic Recordings and will be available on limited edition colored vinyl. This is the first 7" for the band and it will feature three songs, "GUNS", "Weave Teeth", and "North Wilson". Although this release is a milestone for the band, they're not done yet. They have plans to release another new song next month and a full length some time next year. Until that new music is released, you can listen to their latest tunes on Spotify here. Kimball will be joined by The Doozers and Natalie Lucassian for Saturday's show. Tickets for the show are $5 in advance and can be purchased here. The night of the show, cover will be $7 at the door. With paid admission to the show, you will get your hands on that new record too! If you're running low on dough, but still want to check Kimball out live, we are also getting a few people into this show for free. To enter to win, send your name to hipindetroit@gmail.com with #kimball in the subject line. We will draw two lucky winners on Saturday morning and they will each get in the door with a friend for free that night. Doors are set to open at 8 p.m for this one. For more info, click here.